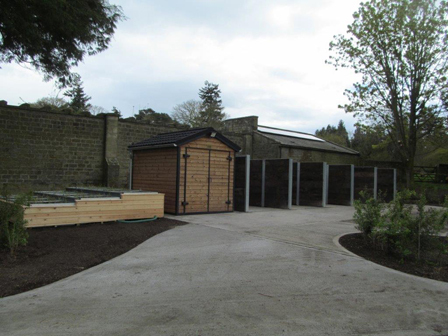 We are used to working on the grand buildings at Belsay Hall but this project, just completed and ready for use, has given us quite a different design challenge – a new composting area. The Hall, Castle and Gardens combine to form a site of national significance, all in the guardianship of English Heritage. The 12 hectares of gardens are actively maintained with a view to their original form. The new facility will enable the gardening team to sustainably recycle the cuttings that are an inevitable result of garden maintenance. Compost bays will allow the gardener’s to produce their own compost. A reedbed system will treat leachate from the compost prior to discharge to a soakaway. A modular storage building houses a generator to power the pumps associated with the reedbed, with battery back-up from PV panels. Hedging has been planted to provide localised screening.